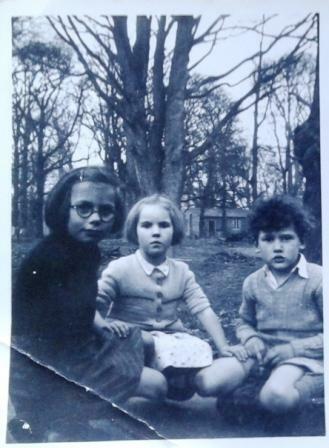 I was born in Ealing Hospital on the 6th November 1942, during the blitz, I was too young to remember it but we were bombed out and had to move. My first memory is of being four years old (1946) and moving into the disused RAF camp, on the South side of the A2, in what I knew as Cobham Woods. We lived there until 1951 when we were allocated a council house on Shorne Ridgeway. My father had been in the navy and must have heard about the camp from some of his shipmates as I believe the Navy took over the camp from the RAF and there may already have been ex-navy personnel living in the camp. We were lucky enough to find a very large double hut shaped like a capital H and moved in as squatters. My parents made it into a three bedroom dwelling and it also meant that there was plenty of room for my sister and me to run around in. Later on the camp was taken over by Strood District Council and started charging rent for the huts. The right hand upright (of the H) was my parent’s bedroom, the cross member was mine and the left hand upright was my sisters bedroom, living room and at the bottom the kitchen and toilet. There was no bathroom, like a lot of people at the time we had a galvanised tin bath. Times were hard and we didn’t have many possessions. All I can recall are, three beds, dressing table, wardrobe and table and chairs in the living room. Cooking was done on an electric hob/oven and the heating was from a Queen Anne coal fire stove in the living room. In the winter the rest of the building was in sub-zero temperatures. At the rear of the hut there was a large circular coal yard surrounded by a high wire fence. There was a reasonable amount of coal in the yard that I’m sure my parents must have made good use of. My mother made a garden in front of the hut for us to play in and in the middle was a very large, old oak tree that was decaying at the base of the trunk. This was home to some gigantic stage beetles that we played with, trying to make them race against each other. Surprisingly, we had no fear of these fearsome looking creatures. Across the road from our hut was a large fire water tank that must have been 6 to 8 feet high by about 15 to 20 feet in diameter and painted a dull rusty red/brown. Next door to this was a two storey brick built building that was about the size of a large house. We were told this was a de-contamination building in case of chemical attack (this was never confirmed) and were warned under threat of severe grounding never to go anywhere near it. In fact we were so scared we always gave it a wide berth. The ground where our hut in the woods once stood is now gone, the cutting for the high speed channel tunnel link has taken its place! At the top of the road, on what was once the old Watling Street was a little shop and I was given to believe that it had been the gatehouse/guardhouse to the camp when it was used by the military. One of our ‘playgrounds’ that we used quite often was the Gravesend Airfield. Another pastime, as autumn arrived, was to collect and bag sweet chestnuts that were sold to Lord Darnley at Cobham Hall. 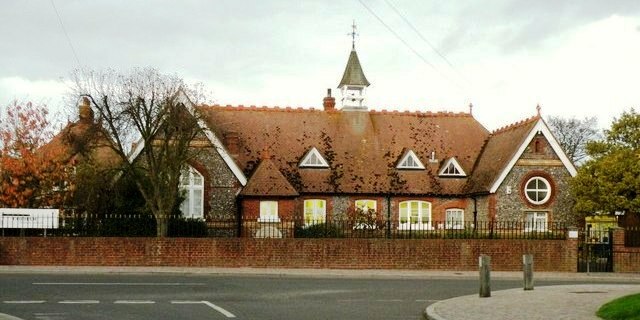 While we lived at the Ashenbank camp I attended Cobham Primary school and it looks exactly the same today as it did then. We used to walk to and from school with virtually no traffic on the roads it was quite safe. The school always seemed to be cold and the daily bottle of milk (one third of a pint) was compulsory. The bell on the school roof was rung at the end of play time and dinner time and we had to line up in our age groups before we were marched to our relevant classrooms. I can remember that my time at Cobham school was very happy but had to come to an end when I was eleven and moved to Southfields, a very frightening experience for a little country boy. There was a sweet shop just along the road from the school that was run by an old lady from her front room. We would go in there once a week with our three penny piece (known as thrupence) and ration book. We spent the thrupence and the old lady took one stamp out of the ration book. It is now a private house called ‘The Candy Box’, opposite the church and a couple of doors up from ‘The Leather Bottle’, an old haunt of Charles Dickens. A couple of years after we moved to the Ridgeway I left Cobham Primary School and went to Southfield Secondary Modern School. My father managed to get a job at the clay works, which was on the North side of the A2 and is now in Shorne Woods Country Park, where he worked for several years. 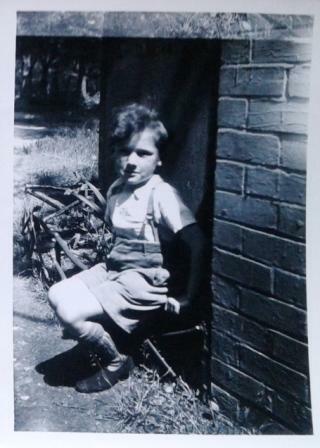 The clay works was out of bounds to children but occasionally dad would smuggle us in and we would sit in the little tea hut in front of the oil drum brazier drinking hot sweet tea made for the work gang. As a lot of workmen did back then, they used Fussells condensed milk instead of sugar and milk which made the tea very sweet! The giant crane dug out the clay, swung round and deposited it onto a seemingly endless conveyor belt that took the clay to the other side of the pit to be loaded on to eight wheeler lorries and transported to a cement works near Cuxton alongside the river Medway. This was all a long time ago but my memories are quite vivid and I can still visualise the layout of the camp and have drawn a map to go with this text. I also have two photographs from when I was living in the camp. This entry was posted in Oral History and tagged ashenbank, social history, world war II. Bookmark the permalink. 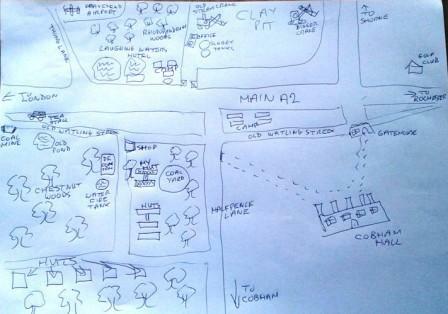 I remember living at the camp in cobham woods ! My dad came home from being in the navy, with no where to live. I was born in early 1947, so we all moved to Cobham. Dad and a few other chaps got the electricity working. Other families came. The milkman and grocer delivered, and we had a good time, until the council found us homes in the early 1950s. We managed OK. Went to school and life was good ! Fantastic John, would you be happy to email andrew.mayfield@kent.gov.uk to discuss things further?